Interspecific Geraniums are a cross between Ivy Geraniums and Zonal Geraniums. These plants can take the heat and have drought-tolerant flowers. Their double flowers are magnets for butterflies and hummingbirds while keeping away deer and rabbits. 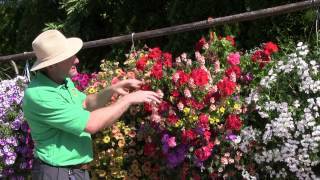 Interspecific Geraniums work great in hanging baskets, containers, or out in the ground. Popular varieties we carry are the Calliope Series and the Caliente Series.